Solar and wind are likely the fastest growing new electric generating sources since cities started electrifying in the late 1800s. A new report out from Environment America shows that the amount of solar power in the US energy mix was just a percentage of a percentage (0.05 percent) to 2 percent of the US’s electric generation mix, an 39-fold increase in just a decade. To put it another way, in 2008 there was only enough solar power in the US to power about 180,000 homes. By the end of 2017, there was enough to power 7 million US homes—and its still rising. By the end of the first quarter of 2018 there was enough to power 10 million US homes. 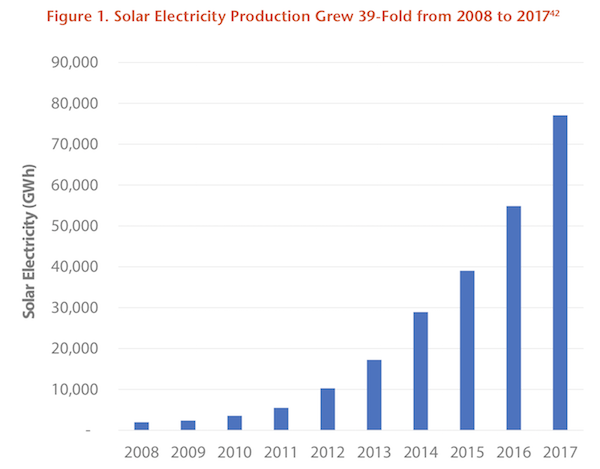 That’s according to Frontier Group and Environment America’s new co-produced report: Renewables on the Rise: A Decade of Progress Toward a Clean Energy Future, which finds that despite the Trump Administration’s efforts to promote fossil fuels over renewable, clean energy, it’s still on a significant rise. Indeed, it’s not just rooftop solar, the US has also drastically increased the amount wind power and energy storage it has installed as its reduced overall electric consumption through energy efficiency efforts, all while the economy has grown, the report showed, essentially echoing findings from a recent report on California’s efforts to reduce emissions on a large scale. Wind power, for instance, was providing 1.5 percent of the US’s electricity in 2008, in 2017 it provided 6.9 percent of the US’s electricity. During the same period overall energy consumption has fallen by 1.1 percent since 2008. The report found that the country now uses less energy than it did in 2000, when the country had 44 million fewer people. The report anticipated that the trends will continue as state and companies are taking actions to shift to renewables even as the federal government dawdles under Trump. It looked to Hawaii’s example as the first state that is moving to 100 percent renewable energy and other states like California and Massachusetts that are significantly increasing their portion of renewable energy generation by boosting their renewable energy portfolio standards.